This photo was sent to me by researcher Harold Barger. He says it was found in the Bible of Ella Shanks Stevens, who was his daughter in law. John Samuel Stevens married Mary Adams, daughter of John Adams and Epsey Young, on 14 December 1859 at Clarke County, Mississippi, The marriage was performed by Hanson Goss, M. G. It is only a best guess that this marriage is correct. The John Stevens who was the father of William Archie Stevens did live in Clarke Co., Mississippi and was on the census there in 1870 and previously. He married Rebecca Jane Adams, according to the family Bible. That marriage, according to Who Married Whom in Jasper County, Mississippi, in 1862. Mary had a sister Jane Adams. I am conjecturing that John Stevens first married Mary Adams and that they had a son Rankin. Soon after Rankin's birth, Mary must have died and John married her younger sister, Rebecca Jane. This is substantiated in the written document that lists the Adams family information. 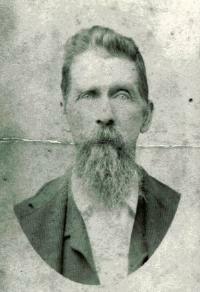 John Samuel Stevens began military service on 13 April 1861 at Crawford, Lowndes County, Mississippi. In a personal statement given a number of years later, a John S. Stevens stated that he enlisted 8 April 1861 at Crawford, MS, and continued until April 1865, in Company E, 11th Mississippi Regiment, as a private. The military service record of John Samuel Stevens includes the following: In the Military Service Records for John S. Stevens, he was also referred to as Samuel J. Stephens. On several occasions he was detailed to drive wagons. On 15 April 1863 he was admitted to the Poplar Lawn Hospital with Vulmus Sclopet, which means a gunshot wound. He was again admitted to the hospital with Vulmus Sclopet on 27 Sept 1864. He was in the hospital with chronic rheumatism 26 Feb 1865 until 24 March 1865. On 4 April 1865 he was captured at Petersburg and was held prisoner until 19 June 1865, the end of the war. [S217] Civil War Military Service Records, National Archives (Washington, D.C.: U.S.Government). Hereinafter cited as Military Service Records. [S37] 1850 United States Census, population schedule, Pike County, Alabama, p. 222, family 1184, a farmer. ; digital image by subscription, The Generations Network (http://www.ancestry.com); from the National Archives microfilm. A printed copy is in the personal records of this researcher. [S96] Glennie W. Kamper, compiler, Marriage Record Book A, Clark County, Mississippi 1853-1865 (n.p. : Lauderdale County Dept. of Archives & History, Inc.), Page 35.. Hereinafter cited as Clarke Co. Marriage Book. [S48] "Adams Family Notes," (MS, about 1850; Lakewood, New Mexico); old papers, hand written, a printed copy is in the personal records of this researcher; Florence, Pinal County, Arizona. Hereinafter cited as "Adams Family Notes." [S33] 1860 United States Census, population schedule, Quitman, Clarke County, Mississippi, p. 614, family 185, farmer. ; digital image by subscription, The Generations Network (http://www.ancestry.com); from the National Archives microfilm. A printed copy is in the personal records of this researcher. [S148] National Park Service Collections, online http://www.civilwar.nps.gov/cwss, Regimental History 11th Infantry, Mississippi.. Hereinafter cited as NPS Collections. [S235] Stewart Sifakis, compiler, Compendium of the Confederate Armies, Mississippi (New York: Facts on File, Inc., 1995), pages 90-91. Hereinafter cited as Compendium of the Confederate Armies. [S28] Patricia and Edwards, Patricia N. Strickland, compiler, Who Married Whom in Jasper Co., Mississippi (P.O. Box 5147, Moss Point, MS 39563: Self published, 1994). Hereinafter cited as Who Married Whom in Jasper Co.
[S115] Jean and Edwards, Patricia N. Strickland, compiler, Jasper County, Mississippi, Paulding Newspaper Items (Moss Point, Mississippi: Ben Strickland, 1997). Hereinafter cited as Jasper County Newspaper Items. [S101] Stevens Family, Turney Family Bible (n.p. : n.pub., unknown publish date); Joanne Stevens Dalton, Albuquerque, New Mexico, Written on a note inside the Bible.. Hereinafter cited as Turney Family Bible. [S451] Headstone and Cemetery Collection, Created by: flgrl, Record added: May 17, 2009, Find A Grave Memorial# 37201749., Findagrave.com.